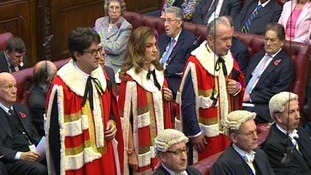 Businesswoman Karren Brady was introduced to the House of Lords today by her television co-star Lord Sugar. Baroness Brady has been appointed a Conservative member of the House. She was dressed in an ermine robe during the short ceremony, in which she pledged her allegiance to the Queen before signing the Upper House's code of conduct. She was welcomed with the traditional cheer from peers as she left the packed chamber. Great to see @karren_brady - the Conservative Party's Small Business Ambassador - join our team in the House of Lords today. Baroness Brady is best known from the BBC's The Apprentice, but she is also the Government's small business ambassador. Sometimes referred to as the First Lady of Football, she became the managing director of Birmingham City FC in 1993 when she was just 23. When the club was floated on the London stock exchange in 2002 she became the country's youngest managing director of a PLC. She is currently vice chairman of West Ham FC and sits on the boards of Simon Cowell's production company Syco and retail giant Arcadia.